Alliance Party leader Naomi Long has accused Karen Bradley of an "appalling dereliction of duty". 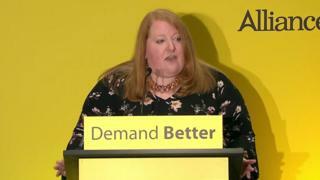 Mrs Long made the comments criticising the secretary of state at the Alliance Party annual conference in east Belfast. "I haven't seen Karen Bradley's to do list," said Mrs Long. "But if restoration of the devolved institutions is indeed her number one issue, heaven help those who find their concerns further down the list." Mrs Long said the secretary of state had made "no concerted effort to end this interminable drift despite it allegedly being her top priority". Mrs Bradley has been secretary of state since January 2018. Last month, she and Tánaiste (Irish Deputy Prime Minister) Simon Coveney met with the five main Northern Ireland parties and said they would be putting proposals to them for restarting the talks process. The secretary of state has also sought further public appointment powers in the absence of a Stormont executive. "Her claim in the House of Commons that she has approached resolving this impasse with laser-like focus is evidence only that we can now add lasers to the list of things the secretary of state knows nothing about," Mrs Long said. BBC News NI has contacted the Northern Ireland Office for a response. Mrs Long also criticised Northern Ireland's political parties for failing to find a resolution, and reiterated her call for an independent chair to be part of future negotiations. On Saturday, Alliance Party deputy leader Stephen Farry welcomed a commitment by the Taoiseach to make health and educational rights for people in Northern Ireland a negotiating priority. It followed comments made by Mr Varadkar to Alliance supporters at its annual dinner on Friday. The commitment relates to the European Health Insurance and the Erasmus university exchange programme. Mr Farry said the comments were "encouraging". In his address to the conference, Mr Varadkar said he wanted to see the schemes remain available to the citizens of Northern Ireland whether they hold an Irish or British passport. In his comments on Friday evening, the Taoiseach said: "I also want Queen's and the University of Ulster to be allowed to opt into the EU research programmes. "If the Withdrawal Agreement is ratified, this will be the case until 2021. And, it will be a negotiating priority of mine, to make it part of the future relationship." Image caption Leo Varadkar has said rights for Northern Ireland citizens will remain a "negotiating priority"
Mr Farry told BBC News NI his party "would be keen to talk more with the Irish government over the coming weeks to see how exactly that can be turned into practice". "I think there is that degree of unease around exactly how far the rights aspect will go in practice. And [the Taoiseach's remarks] are maybe pointing in a new direction of travel which I think is very, very encouraging," he said. Erasmus: What will happen to scheme after Brexit?